Friday, August 25: Several staff members got to observe the mating ritual of Eastern Massasauga Rattlesnakes today. This is the first time this rare event has been observed at Ojibway. Female Massasaugas have a very brief mating season, only a few days every other year! The wet summer continues to produce interesting sightings at Ojibway, even mosquitoes! A very large mosquito, Psorophora ciliata, has been present this month. The larva of this species is carnivorous and each one will consume dozens of other mosquito larvae. This species is rarely seen in Canada and has been found at Ojibway only during wet summers. Ojibway's field trip to Pelee on Wednesday found good numbers of Blue-grey Gnatchers, Baltimore Orioles, Orchard Orioles, Ruby-throated Hummingbirds, Yellow-bellied Flycatchers and several warblers. Many song birds are easier to observe in August before Sharp-shinned Hawk migration begins and birds become reluctant to leave heavy cover. Monday, August 21: Migrant warblers seen in the park yesterday by Fred Urie included Blue-winged Warbler (1), Chestnut-sided (6), Black-throated Green (4), Black-and-White (3), Blackburnian (3), American Redstart (3), Nashville (2), Magnolia (1) and Black-throated Blue (1). Holiday Beach C.A. and Point Pelee also reported a variety of warblers over the weekend. Green Darners are starting to migrate. Over 2,500 of these large dragonflies were seen at Holiday Beach yesterday. Friday, August 18: Migrant birds are becoming more apparent this week. A large flock of American Robins was present on the lawns around the nature centre on Wednesday, warblers are passing through, new hummingbirds are visiting the feeders and a few Common Nighthawks are being seen in the evenings. Monday, August 14: Another new damselfy for Ojibway was found on Saturday. A Sweetflag Spreadwing, Lestes forcipatus, was discovered in the nature reserve at one of the many temporay ponds left by recent rains. Friday, August 11: A new damselfly for Ojibway, the Citrine Fork-tail, Ischnura hastata, was observed in the nature reserve today. The wetter than normal weather has left standing water at many sites that are normally dry in late summer. These ephemeral pools provide potential breeding sites for this tiny damselfly. Visit our new page on fireflies. Two distinctive insects of late summer are now being heard at Ojibway. Male dog-day cicadas (Tibicen sp. )have started singing their loud, buzzing songs during the day (first heard at Ojibway on August 6). Dog-day cicadas are about 5 cm long with dark, greenish marked bodies and clear wings. Females lay their eggs in the twigs of trees but when the nymphs hatch they fall to the ground, and enter the soil where they remain for many years. Northern True Katydids (Pterophylla camellifolia) are heard at night (beginning July 26). Their loud, distinctive "katy did" song is common over much of the Northeastern US. In Ontario they can be heard only in the Carolinian region. Mid to late August is the peak of the flight season for underwing moths. Click here for information on how to attract and observe these colourful insects. Tuesday, August 8: The Pelee Island Butterfly Count was held on Saturday, August 5th. Highlights from the forty species recorded included a Harvester, Feniseca tarquinius, Common Ringlet, Coenonympha tullia, Zabulon Skipper, Poanes zabulon, 248 American Snouts and 46 Common Buckeyes. 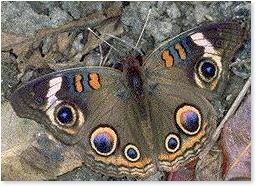 Tuesday, August 2: Four Common Buckeye butterflies were seen along the Titcombe bikeway yesterday while members of the Friends of Ojibway were out removing exotic plants. Giant Swallowtail Butterflies are now conspicuous, having started their second brood on July 26. While Monarchs continue to be seen in very low numbers the look alike Viceroy is very common at Ojibway. Several baby garter snakes were found today. The first neonate of the summer was seen on July 21 by Russ Jones. Click here for July 2000 sightings.